Palouse Heritage farm co-owner Don Scheuerman, center, and Palouse Pint's Joel Williamson, right, chat with attendees at the Purple Egyptian Barley Project's first week. When people think about beer, hops typically get the most attention. But an ongoing local collaboration is celebrating beer's main ingredient — malted barley — for a seven-week event dubbed the Purple Egyptian Barley Project. Named for its dark, purplish hue, Purple Egyptian barley is virtually never grown in the United States, but each Thursday through the first week of April, a new bread and beer made with this distinctive grain will be presented at Bellwether Brewing Co.'s Monroe Street tasting room. The Project is a collaboration between four friends who represent the entire supply chain: Don Scheuerman of Palouse Heritage Farm grew the barley with other farmers on the banks of the Palouse River; Joel Williamson of Spokane Valley's LINC Foods Palouse Pint malthouse malted the grain so it could be turned into beer; Thomas Croskrey of Bellwether made seven different beers with the malt; and Shaun Thompson Duffy of Culture Breads is making seven varieties of bread to pair with those beers. People who attend at least six of the seven tastings can earn a prize package and a commemorative pint glass bearing each business' logo. 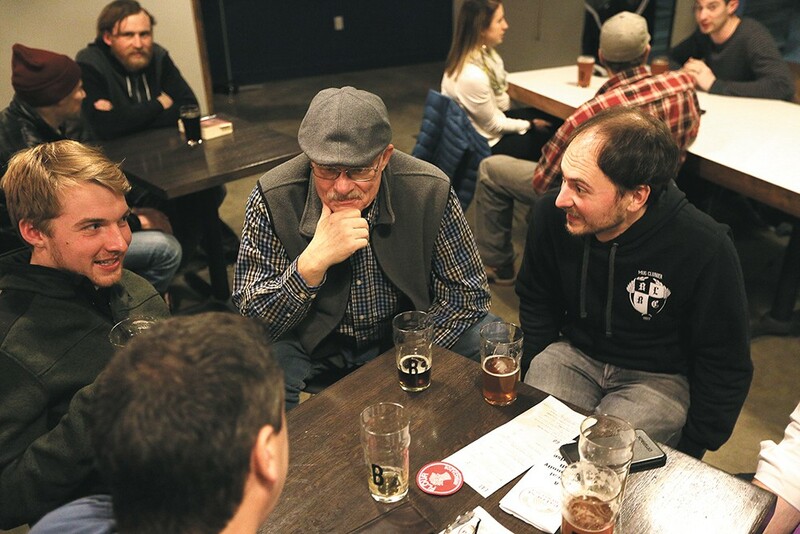 They can also vote for their favorite beer during week seven, and Bellwether plans to brew a full-size batch of the winner for Spokane Craft Beer Week in May. Purple Egyptian barley is a centuries-old landrace variety, which means that unlike modern grains, it originated by chance rather than through selective breeding, and naturally adapts to its growing environment. "It was originally sourced in what's called Upper Egypt, and actually in the Old World it was called Abyssinia, and now it's in the mountains of Ethiopia," explains Scheuerman of Palouse Heritage. Working in conjunction with Washington State University, Scheuerman and his brother Richard were able to source a small amount of Purple Egyptian seed from a seed bank, and they have planted and multiplied it over several years. While a few other similar varieties are grown on a small scale in the U.S., Scheuerman says he's not aware of anyone else growing this strain. As a landrace, Purple Egyptian presents some unique opportunities and challenges for everyone involved. On one hand, its ability to adapt to its growing region — actually changing its genetics to thrive — gives it a sense of terroir, which means it is influenced by the soil, sunlight and climate where it's planted. On the other hand, it's tough to grow and malt. Malting is the process of turning complex starches inside a grain into simple sugars that yeast can eat and turn into alcohol and carbon dioxide (beer). Grain is tricked into sprouting, allowed to germinate, then the process is halted with heat and air. Modern malting barleys behave in a uniform manner, making the malting process more predictable, but Palouse Pint's Williamson says that wasn't the case with Purple Egyptian. Due to what is thought to be a survival mechanism, individual grain berries of landraces often germinate at different rates. "You wouldn't really want that for malting, but it is what it is, and it has other beneficial characteristics like the color and the flavor and the story," Williamson explains. Bellwether's Croskrey says that the malt's distinguishable flavor definitely comes across in the beer. "It has that touch of nuttiness and fruitiness on it that I've never had in any other malt," he shares. "It's just like a big mixed fruit bowl." All seven of Bellwether's beers will be made with at least 75 percent Purple Egyptian malt, and one — made with malt that Scheuerman smoked himself — will be 100 percent Purple, with added pine resin. Another, a brown porter, features malt that Williamson and Duffy roasted in Duffy's wood-fired bread oven. Duffy, who plans to pair each of his breads to the beer of the week, is using several forms of Purple Egyptian barley. He stone-milled some raw barley flour, he's reusing spent grain from Bellwether's beers, and for at least one bread, he's going to add rehydrated malt for a raisin-like flavor and texture. While it doesn't make purple beer, Purple Egyptian does lend a purple hue to the bread. It also offers some complex flavors that Duffy enjoys. "The Purple barley flour is definitely earthy, and there are some honey notes in there, so it's a little sweet," shares Duffy. "It definitely has a little bit of a tang to it, almost like a citrus pithiness." Scheuerman is growing other landrace grains at Palouse Heritage which they may malt in the future, and Williamson says that Palouse Pint has also malted some other unusual grains, like spelt, triticale, and Baronesse barley. He says each one offers unique stories and flavors, and the Purple Egyptian is no exception.